Blue hues. A dreamy celestial blend of organic essential oils that evokes the sky and wind. 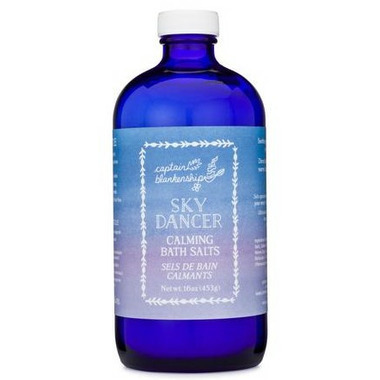 A soothing blend of sea salt and epsom salts helps detox and soften skin skin. The mix of essential oils create an airy, contemplative scent, great for calming and reflection. Like a fresh dip in a warm sea! Sea salt is full of many minerals and nutrients that are beneficial for the skin, it helps open up pores and leaves a radiant glow. It also carries numerous health benefits for the body, such as improving circulation and muscle cramps. Epsom Salts are not actually salts but a natural compound of magnesium and sulfate. Both minerals are easily absorbed by the skin. Sulfates help flush our body of toxins and ease muscle pain. Magnesium is the perfect antidote to stress as it helps the body to produce serotonin. Directions: Shake ¼ to ½ cup of salts into warm (or cold) bath or as desired. Relax, soak and enjoy. Ingredients: Pacific Sea Salt, Epsom Salt and Organic Essential Oils of Lavender, Tangerine and Palmarosa.